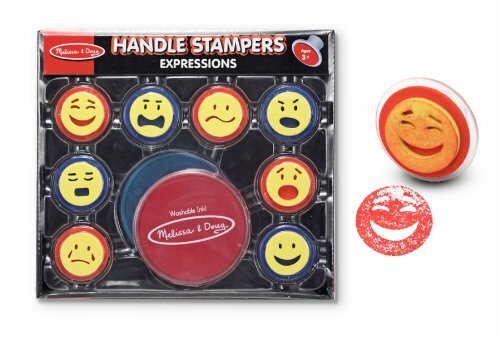 One of the neatest things I’ve found to buy my kids in the last couple of years is this set of “Expressions” Stampers from Melissa & Doug. They turn any kid – and even me! – into a reasonably competent cartoonist. They’re just plain fun, plus they’d probably be fantastic if you were working with a kid just about anywhere on the autism spectrum. So anyway, the two concepts came together in my mind late, LATE last Thursday night when I was planning for our “stamping” themed homeschool Shabbos party. So before we actually got around to creating our own stamps for the parsha (click here to see them), I “read” the kids a very, very simplified version of the parsha, creating stick figure cartoons as we went along. Then, I let the kids copy the cartoon, adding their own touch. Please remember that I cannot draw at all – so I was pleased that doing it this way let me skip the hard part of drawing (creating the expressions) and get right to the story, quickly. Also, you can get a “crowd scene” drawn very quickly – stamp, stamp, stamp and there they are! Here’s my version of the giant Og (wearing a hula skirt around his arms, for some mysterious reason), trying to drop a rock on bnei Yisrael. They are smiling because they know Hashem will protect them. And the smiliest of all is Moshe, who is chopping Og’s leg with an axe. It was a bit of a crazy free-for-all once I let the kids grab the stampers, but they did some neat stuff. On the left is Gavriel Zev’s, showing the giant Og terrorizing bnei Yisrael (or perhaps this was supposed to be the meraglim – I forget, and we did several scenes). Naomi’s, on the right, is another scene, where Moshe tells bnei Yisrael at the start of sefer Devarim that he will soon be leaving them. Totally unrelated, here are two cartoons that Gavriel Zev did yesterday with the stampers. He was a late starter and basically never drew a thing before his third birthday (these stamps were his present from me, I believe); his style is still rather unsophisticated for his age and level of verbal ability, to say the least. So I think he appreciates the way these let him create pictures anyone can understand. The bigger boy has taken the smaller boy’s soccer ball, the smaller boy is angry and objects. I liked this picture very much, but GZ was not pleased with it at all. He realized quickly that angry was not the expression he wanted, and was about to stamp over it when I said that wouldn’t work and offered him a fresh sheet of paper. Same picture, but now, the smaller boy is sad instead of angry. And instead of words (oh, this made me very happy), the “explanation” arrives in the language of numbers: the big boy is 10; the small boy is 3. This is a heartbreaking scene, showing in three simple backwards numerals a very young boy’s dawning comprehension of the world of injustice in which we live. The funny thing is that I saw about 100 Picassos today (okay, 147), and then came home and THIS crazy cartoon-stamper artwork done by my little boy stirs my heart in ways Picasso and his colleagues could never, ever begin to touch. But I did like this sculpture, “L’homme au Mouton” (Man with a Sheep). I love the word sheep, and the whole image, well, it strikes me that it is saying something totally awesome, though I am not smart enough about art to figure out what it is. The whole thing seems full of life, movement, and humour, despite the man’s sombre expression… and I adore the precariousness of the situation, because this is NOT a comfortable pose for either the man or the mouton.